I have not one but two posts for you today…I’ve been baking like a trooper all weekend! It was my hubby’s Birthday yesterday and I wanted to make him a really special cake. He injured his ankle last week and has been in a lot of pain. He has also been pretty ill over the last couple of weeks so he’s been pretty down in the dumps. 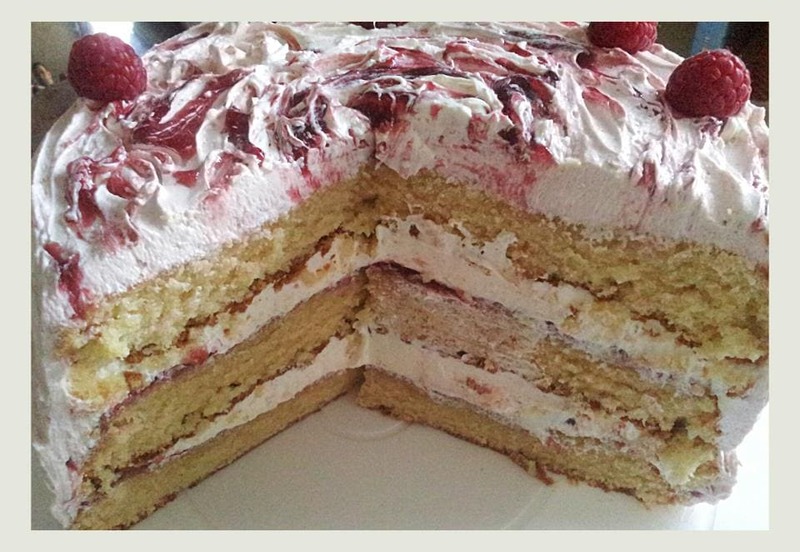 I asked him what cake he would like me to make him for his Birthday and he requested this gorgeous raspberry ripple cake. I made it last year for my Birthday and it was SO good I was waiting for an excuse to make it again. So I didn’t need to be asked twice! The recipe comes from Edd Kimber’s book “The boy who Bakes.” Ed won the first series of the Great British Bake off and with creations like this its no wonder. There are some other stunning bakes in the book including a drool worthy cinnamon and caramel cake, apple pie cake, cranberry & macadamia shortbread and orange & passion fruit loaf cake to name a few. If you bake then you need this book in your life! So what else can I tell you about this cake? It’s basically raspberry ripple ice cream in cake form. The sponge is vanilla scented and amazingly light and fluffy. The Italian meringue frosting is so light and melts on your tongue. It’s truly amazing stuff. Now I’ll be honest and say that this not a straightforward cake to make but it is totally worth the effort. If you make this be prepared to spend a few hours in your kitchen! It’s not difficult to make but there are a few fiddly steps. You do need a sugar thermometer and a good mixer (unless you are actually The Rock or have his muscles!) for the Italian meringue, but that’s the only specialist equipment you’ll need. Preheat oven to 180C/160C fan oven/gas mark 4. Lightly grease 3 20cm tins and line the bases with baking parchment. Sift the flour and baking powder into a medium bowl. Set aside. Cream the butter and 300g of the sugar together until very light and fluffy (at least 5 minutes.) Beat in the egg yolks one at a time while still mixing, then add the flour mixture and milk alternately, mixing on low until the mixture is smooth and combined well. Place the egg whites into a clean bowl (this is when having another KA bowl would come in very handy!) and whisk on medium until the mixture holds soft peaks. Increase speed to high then gradually and slowly add the 100g sugar until the mixture is very firm and glossy. You should have stiff peaks. Gently and gradually fold into the cake mixture until the mixture is smooth and well combined, then spoon into the prepared cake tins. Bake for 30-35 minutes or until the cakes are well risen and a skewer inserted in the middle comes out clean. Cool in the tins for 10 minutes, then turn out onto a wire rack and leave to cool completely. For the frosting, melt the chocolate slowly over a pan of simmering water. When melted and smooth take off the heat. Place the sugar and 160ml water in a medium pan. Place a sugar thermometer in the pan. Slowly bring to the boil (don’t have the heat on full throttle – you’ll end up with a blackened mess!) It’s better to have the heat on medium, it will slowly start to boil. Make sure you keep an eye on it. Meanwhile place the egg whites in a clean bowl. Whisk on medium. Once the sugar thermometer reaches 115C, start whisking the egg whites on high. Once the thermometer reaches 121C, remove it from the heat and with the mixer still running, slowly pour the sugar syrup down the side of the bowl without touching the beaters. Continue whisking on high (My treasured KA certainly got a work out) until the meringue has cooled to room temperature. Basically when your mixer bowl no longer feels hot to the touch. This takes roughly around 10 minutes. With the mixer still on high, gradually and slowly add the soft butter. Now I must warn you, at this stage it may look like scrambled eggs. Don’t worry. It’s not a disaster. Keep that mixer going! It will smooth out. I promise. When the frosting is (eventually) very soft and fluffy (dream like!) divide the mixture into two bowls. Stir the melted white chocolate into one and the raspberry jam in the other. 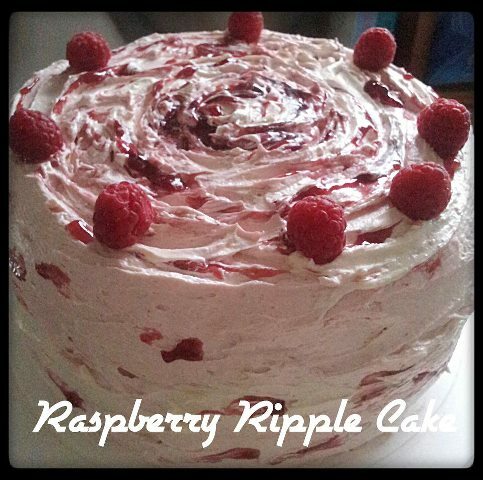 You don’t want to stir the raspberry jam in too much – you want to see those beautiful ripples! To assemble, place one sponge on a plate. Spread generously with some of the raspberry jam. Top with a generous amount of the white chocolate frosting. Repeat with the second cake layer the place the third layer on top. Spread the raspberry jam frosting all over the top and sides of the cake. The beauty of this cake is that your frosting doesn’t have to be perfect – it actually looks better rustic. Alternating swirls of the white and raspberry frosting are a gorgeous thing here. If you have a little bit of jam leftover you can “artistically” *ahem! * place random blobs here and there, swirling them with the white frosting. Sit down. Have a cup of tea. And bask in the sheer beauty of the epic cake you have just made. Wow! It looks incredibly moist. That frosting! I wish I could just eat the entire thing. It certainly did! He loved it. It wouldn’t be hard to eat the whole thing Melisa! I’m in love with the frosting, it’s unbelievably good! Thank you 🙂 This cake really does have the WOW! factor. Hi Kath, sorry to hear this – it’s always annoying when a recipe doesn’t turn out. My tins have a depth of about 5cm and the sponges do rise to the top of the tins. They usually take 35 mins at 180c in my oven. The meringue frosting needs a lot of beating with a mixer, and if it looks like it has curdled don’t despair – keep beating and it will come together. As long as you add the butter slowly it should be fine. Any more questions don’t hesitate to ask.